I have run a model for 14 year's (168 Time steps) and I need the recharge values for each cell in all these Time steps together in one output. 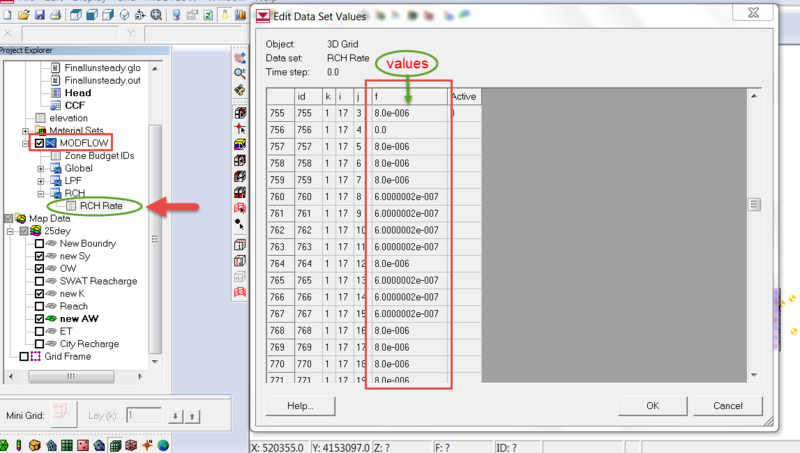 Currently As you can see in the attached screen shot I can only see the values for one Time step at a time. Can you select them, copy to your clipboard, and then paste in a spreadsheet? Thanks for your quick respond but this ASCII.dat file is just one time step and i want all of them together ( 168﻿ T﻿ime steps ). Also i need cell properties along with the values. Based on some further testing. I was not able to reproduce this problem in the latest version of 10.3. If you follow these steps you will get an ASCII *.dat file with all timesteps. 1. Duplicate the RCH Rate item in the MODFLOW\RCH\RCH Rate. This will create a new dataset. 2. Right click on the newly created dataset and choose the Export option from the menu. In the dialog, select the "ASCII Dataset Files (*.dat)" filter and save the file.